Onederland or Bust! : Still kickin'! I've been busy, but I also just wasn't in the mood to write. My parents got here Monday and I've been staying at my sisters all week so I haven't been on the computer much. I had like a bazillion blog posts to catch up on today! I didn't lose any weight last week, but I didn't gain any either. However, my weight has been fluctuating between 249-251 all week... not cool! It doesn't help that my mom works in a chocolate store and brought a bunch of goodies with her - shoot me! Yeah, so I'm going running after work today and hope to get another one in friday morning. I need to keep running while my parents are here because I think that will be my savour for not gaining weight while they're here. We'll be celebrating at my sisters with some family and friends. We're going to have homemade pizza and later that night some friends and I are going out on the town! I haven't been out with these friends in forever so I'm really looking forward to it. I somehow need to stay on track this weekend... it should be interesting. I've also been slacking in the running department as of late. 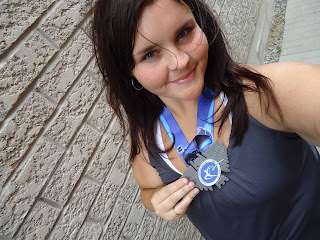 My second official 5k race is on September 29th at the Toronto zoo (how cool is that!?) and I realllllly want to run the entire thing without stopping. This course is going to be more challenging because there are hills and I haven't been training for hills. For the next 30 days I MUST get in 3 runs per week and at least 3 practice 5k runs. I love that my parents are here. I haven't seen my dad since Christmas. I wish they lived much closer instead of 42 hours away... It's tough saying bye to them every time they leave. Happy birthday, Bailey!! I hope you have a GREAT weekend!! You can do it--get those runs in!! Happy Birthday!! How fun to have your parents here for a visit and it sounds like you have a great plan in place to sneak some activity in. I LOVE LOVE LOVE September, even better than New Year's Day, because to me, it's always felt like a fresh start. School starts again, we get back into a routine and I ALWAYS feel totally motivated and refreshed to get back on the "weight loss wagon". 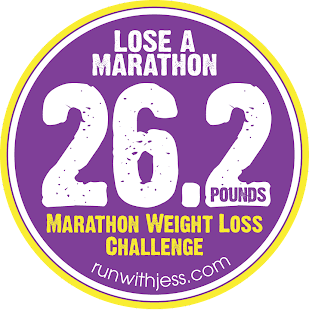 I haven't been doing as well as I'd hoped in the Marathon Weight Loss Challenge but if things keep going the way they are, I'm at least on track to Lose a Half Marathon and I'll be VERY happy!! Have a great weekend with your family and friends and enjoy your birthday!